We love oats as a superfood for their high content of fiber, protein, B-vitamins, iron, and magnesium. 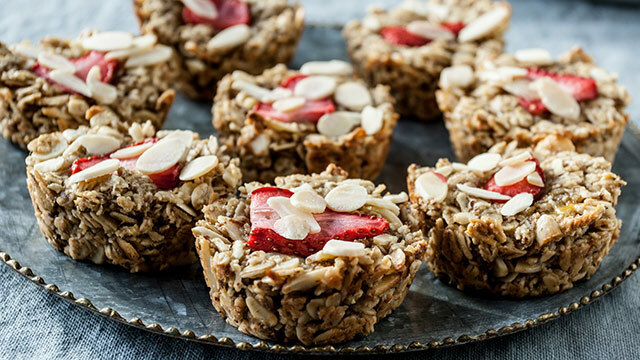 Try them in these tasty little cups for a pre- or post-workout snack. Your kids will love them, too! Recipe courtesy of Andrea Bemis, chef/writer of Dishing Up The Dirt and owner of Tumbleweed Farm, in Hood River, OR. 37 people have left a comment. Join the conversation! I just made these, with the following substitutions: added 1 egg, used whole flaxseed (that’s all I had on hand), used 1 1/2 large bananas. I put the batter straight into a muffin tin lightly coated with coconut oil spray, skipping the chilling stage. Since Valentine’s Day is tomorrow, I put a heart-shaped apple coated in lemon juice and lightly sprinkled with cinnamon sugar on top of each muffin. I baked for 15 minutes, the covered with foil and baked for an additional 10 minutes. They are coming out of the pan easily and not crumbling at all. And they are delicious! I think cinnamon would be a nice addition to the batter. I made these this week. I did them in square muffin tins and added two whipped eggs–the mix made only 10 muffins. They are dense, but delicious. I eat two for breakfast and put a little pad of butter and some organic strawberry preserves. So yummy. I added two eggs to mine. I also used quick oats instead of regular oats. They set up thick and only filled 10 muffin cups. They are baking now. Tasty but a bit crumbly. Looks like I’ll need to use more banana next time. Pretty yummy though.. I just need to eat it with a fork. Added a little brewers yeast making these perfect for nursing moms. Flax, oats and brewers yeast are great for supporting milk supply. My sons and I made these for a snack this morning. The taste was great! We didn’t have syrup or almond butter, so we used honey and sunbutter. I like the idea of trying it with applesauce too (any idea how much?). I used a large banana. While our muffins came out of the tins easily, they were crumbly to eat. I think they would fall apart if I tried to send it to school for my son’s snack. These are delicious! Such a good snack or breakfast on the go! Does anyone know, or has anyone calculated the nutritional info? Hi Ashley, thanks for the suggestion. 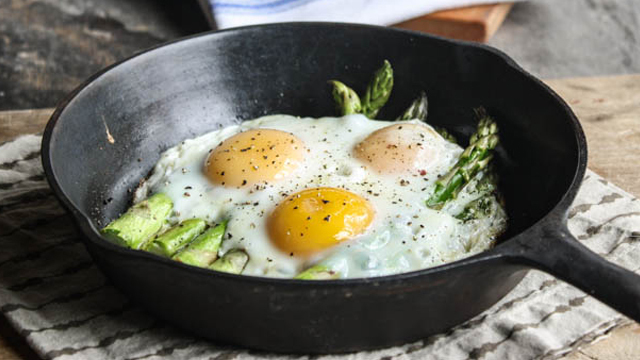 While we don’t have nutritional information for these, all of our recipes are balanced with enough fat, fiber, and protein to keep energy levels up throughout the day. Enjoy! I made a few changes to work with what I had. I substituted: vanilla extract, whole flax seeds, chopped almonds & quick oats. I also used 2 medium ripe bananas. I had to cook them a little longer be cause they were slightly runny, probably due to my substitutions… However, these are so tasty & very moist! Almost like a little cupcake! I used a standard 12 muffin tin and only got 9 out of the batter, filling them 1/4 from the top. Has anyone tried making this with oats that have been soaked rather than using simply raw oats? Hi Wendy, we love this idea. Let us know how they turn out! Just made them and wow, were they crumbly. Anyone have to cook them longer? Am wondering if the problem might be my oven- gulp!! Hi Judi, depending on the size of your banana, you may want to add a little extra to make sure the ingredients bind together. This should help! What is the calorie count per serving? Thank you. Hi Kelly. We believe in eating whole foods that include a balance of protein, fiber, and healthy fats in every meal and snack which is why we love this recipe so much! You can learn more about why we don’t calories here: https://blog.barre3.com/2015/01/06/dont-believe-counting-calories/. I hope this helps. I can’t use coconut oil is there a substation for the oil? Hi Lorri, you can try swapping olive oil for the coconut oil. Let us know how they turn out! How long do these last sitting out at room temperature? Looking forward to making them today! These should last a few days at room temperature. If you’re making a big batch, we suggest freezing half of them to last longer. Let us know how they turn out! Just put these in the oven! I found it helpful to use an ice cream scoop for even measuring and to wet my fingers before pressing the mixture into the tin (no sticking that way). Making these now to prep for the challenge this week! I subbed in peanut butter because I was out of almond, and added an egg to help bind, though it’s probably not needed (some reviews said they were crumbly.) They look so yummy! So, I should onlly eat one of these for my whole breakfast? Some days one might be enough, some days you might want two. We recommend listening to your body. Enjoy! I’d like to try these, but I have a banana allergy. Is there a substitute for the banana you can suggest? Applesauce, perhaps? Yes! You can use 3/4 cup applesauce as a substitute, enjoy. These are so yummy!! A great breakfast or snack on the go!!! The flavor is great, especially the almond extract. Several were really crumbly and fell apart- I found that the muffin tins that had more batter in them stayed together so much better… so next time I’d make these I’d make 10 or so, rather than 12. Thanks for the recipe! I just made these and love them, but even though I doubled the recipe I still only got 12 standard-size muffins. How full did you fill the tins? Mine almost made it to the top with no strawberry or almond slices, so maybe I filled them too full? Regardless, I just ate half of one and they are amazing! Hi Teresa, it should yield 12 muffins in the tin when you fill it close to the top. We hope this helps! I just made these; they are so delicious! You can really taste the almond extract. I saw Audrey’s comment about them being crumbly, and I have to agree. If I worked quickly (and gently!) I could remove them from the pan in one piece. But about 1/3 of them crumbled when I tried to take them out. But, they still taste great! Maybe next time I’ll use muffin liners so there’s no problem. I think they’d also be great with a little bit of cinnamon. Thanks for the great recipe! I am trying these this weekend. I agree with Ashleigh’s comment I too am always struggling with healthy breakfast recipes. Please keep these good ideas coming. I’ve made these twice now. They’re a fun deviation from my usual breakfast smoothie. I want to try different variations like adding dark chocolate chips and dried cherries for more of a cookie-like treat. These sound delicious! I can’t wait to make them this weekend! Made these tonight for breakfast the rest of the week! They turned out pretty well! Some were a bit crumbly, I think I could have cooked a bit longer and/or pressed them more firmly in the cups. The almond extract is divine and I opted for the strawberries. I used a standard 12-muffin tin and if this “serves 3” that would be 4 muffins per serving – seems like a lot? Mind clarifying the serving size, please? Thanks for the recipe! Hi Audrey, thanks for catching this. It is now updated. Enjoy! These look wonderful! Can’t wait to try. Would love to see even more new breakfast recipes. It’s always a struggle finding ways to shake up the breakfast routine.